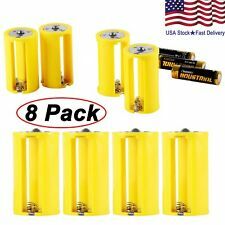 $AA to Size D Battery Adapters Converter Cases Plastic Parallel Yellow 8 PcsFeatures ---This listing is for 8 pieces of the battery adapters ---Can convert any size AA battery to a size D battery ---Option to use 1 AA, 2 AA or 3 AA for more capacity ---Perfect for electronics and emergency situations Specifications Color: Yellow Size: 2.25" x 1.3" Material: Durable Hard Plastic Output voltage: 1.5V Circuit: Parallel Package included 8 x Battery Adapters. Samsung Cellphone. Convert any AA size battery to C size battery. good deal j o ( 1404. d 7 ( 111. Quantity: 4 pcs. Compact and unique design, easy to use. Large strength and strong toughness. ). $AA to Size D Battery Adapters Converter Cases Plastic Parallel White 8 PcsFeatures ---This listing is for 8 pieces of the battery adapters ---Can convert any size AA battery to a size D battery ---Option to use 1 AA, 2 AA or 3 AA for more capacity ---Perfect for electronics and emergency situations Specifications Color: White Size: 2.25" x 1.3" Material: Durable Hard Plastic Output voltage: 1.5V Circuit: Parallel Package included 8 x Battery Adapters. This adapter allows you to use a common CR2032 battery in place of a CR3032 battery. 9v Battery Eliminator (9v Battery Eliminator Connector) - Convert 9-Volt Battery Powered Electronic Devices to Connect to a Wall Power Adapter. 9v (9-Volt) Battery Eliminator Adapter Conversion Connector Only. It does not include any type battery. AAA to AA size battery converter case adapter holder spacer switcher. If you need 1.2V, use 1pc AAA NiMH/NiCd battery convert to AA. If you need 1.5V, use 1pc AAA dry battery convert to AA. Be sure to consider this before ordering. Also, when your 18650 battery requires charging, it must be removed from the adapter. This in no way weakens or affects the functionality of the adapter. This protrusion allows easy access to the battery when it needs to be removed from the adapter. Convert 3 AA to 1 D Size using parallel conversion barrel. Work perfectly with any D size battery device. Convert any AA battery to a D battery. Max convert 3pcs AA battery to D size battery. Option to use 1 AA, 2 AA or use 3 AA for more capacity. Detail Image. Note: Due to light and screen difference, the item's color may be slightly different from the pictures. If you do not received your item or received a defective item, PLEASE DON'T LEAVE NEGATIVE FEEDBACK OR NEUTRAL FEEDBACK OR OPEN A DISPUTE CASE, EMAIL ME FIRST, COMMUNICATION IS KING! Feature: Battery Type: AA to D Battery Converter Color: Translucent White Quality: 4 Package Include: 4x Battery Converters. Not include battery. Included:12 x AAA to AA Cell Battery Size Converter. It is battery limit slot, the battery can be fixed in a good place. Note: Light shooting and different displays may cause the color of the item in the picture a little different from the real thing. 4pcs x Battery Adaptor Case. Input Battery Type : AA. -Whether large capacity or small capacity of the battery can easily put into. Canada, United Kingdom, Austrilia, France, Germany, Spain, Ireland, Italy, Others. Battery AA to Battery C. Compatible with: All types of AA batteries. 8 x Battery adapter. Quantity: Eight. No battery included. Trending at $2.02eBay determines this price through a machine learned model of the product's sale prices within the last 90 days. 4x Battery Converter (Batteries are not included.). With battery limit slot to fix the battery in a good place. Large strength and strong toughness. We will reply you ASAP. Small size, easy to carry. Quantity: 4PCS (other accessories demo in the picture is not included). Item Type: Battery Adapter Converter Case Holder. 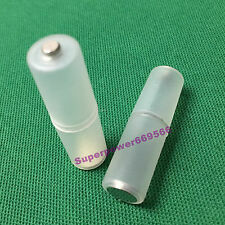 2 x AA battery can replace D battery to use. 2x AA to D: 5.8×3.2cm/2.28×1.26in. Battery Adaptor Converter Case Holder for AAA to AA. 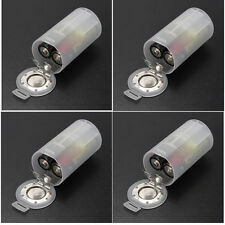 4 X AAA to AA Battery Adapter Converter Case Holder. If you need flash trigger cable Shutter Release Cable for WanSen RF-602 trigger Canon 500D 450D 600D 1000D 60D. 4 x Battery Adaptor Converter Case Holder. (The battery is not included). 1 x AAA battery can replace AA battery to use. 1 x AA battery can replace D battery to use. 1 x2 AA battery can replace D battery to use. 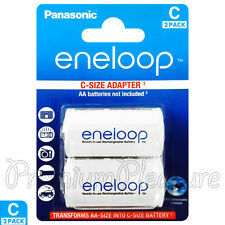 Eneloop AA battery converter x 4. Easy to work, just put the AA battery inside converter and it can be using like a C type battery. It applicable with AA battery only. NO fake products. Converted AA size battery to C size battery. AA to C size battery adapter 8. Compatible With: all types of AA batteries. Battery not include. If you have any problems, we are very glad to help you. 4 x Plastic Parallel AA Battery Adapters Holder 1.5V Converter 3 AA To 1 D Size Descriptions Parallel AA Battery Adapter Holder 1.5V Case Box Converter 3 AA to 1 D Size parallel conversion barrel To connect three AA batteries together for replacing a large D battery Specifications Color: Yellow Size: 56mm x 34mm Material: plastic Output voltage: 1.5V Circuit: Parallel Package included 4 x Battery Adapters. Quantity: 1 set(4pcs). Battery holder converter: Switch size AAA battery to AA battery. 4 pcs x AAA To AA Battery Converter(other accessories demo in the picture is not included.). These battery converter is convenient, reduce weight and save money for you. By Everlasting Glow. AA Battery Converter to Electric. Indoor UL Adaptor. 1 AA and 3 AAA battery blanks included. The AAA-to-AA type battery converter case is used to convert the AAA to AA battery. - Convert AAA battery to AA battery. 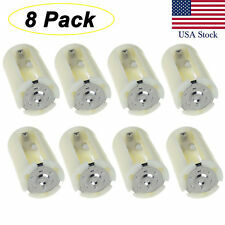 ③New AA to C Size Battery Converter Adaptor 4 PCS Adapter Holder Case. Baby Introduction：. Item Discription. 4AAA To C Size Parallel Cell Adapter Battery Holder DC 1.5V Case Box Converter. Quantity: 1 set(4pcs). Can convert any size AAA battery to a size C battery. Easy to use - just slide in the AAA battery into the converter. 4x AA to C Size Battery Convertor Adapter (batteries not included). Convert any AA battery to a C size battery. Product size: about: 4.5 2.5 2.5cm. Item Type: AAA to AA Battery Converter. This cable is made of high quality material. With it, AAA battery can replace AA battery to use. Easy to carry and use, a great choice for you. 10 AAA to AA Battery Converter. $3 AA to Size D Battery Adapters Converter Cases Plastic Parallel White 12 Pcs Features ---This listing is for 12 pieces of the battery adapters ---Can convert any size AA battery to a size D battery ---Option to use 1 AA, 2 AA or 3 AA for more capacity ---Perfect for electronics and emergency situations Specifications Color: White Size: 2.25" x 1.3" Material: Durable Hard Plastic Output voltage: 1.5V Circuit: Parallel Package included 12 x Battery Adapters. 1pcs x 3 AA to D Size Battery Convertor Adapter. Convert any AA battery to a D battery. Max convert 3pcs AA battery to D size battery. Option to use 1 AA, 2 AA or use 3 AA for more capacity. (Battery not included). Practical: Can convert 1 AAA battery to 1 AA battery. Portable: The battery adapter case is mini, lightweight and portable. Single Size: L W H: 1.4 1.4 5cm(0.55 0.55 1.97in). 1x AAA battery can replace 1x AA battery to use. AAA To AA: 4.8×1.2cm/1.89×0.47in. 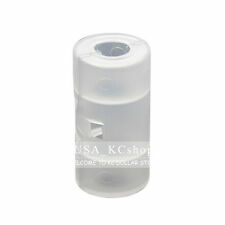 Item Type: Battery Adapter Converter Case Holder. High quality plastic holder. Small size, easy to carry. Due to the difference between different monitors, the picture may not reflect the actual color of the item. 4 x Battery Converter (Batteries are not included.). With battery limit slot to fix the battery in a good place. Large strength and strong toughness. Small size, easy to carry. 4x AA to C Size Battery Convertor Adapter (batteries not included). Convert any AA battery to a C size battery. Type: 4 AAA in Parallel. 1 X Battery Holder Converter(Batteries Are Not Included!). Fit for: 4 x 1.5V =6V. Place two battery converters on a single AA battery and insert into your electronic devices. 8 converters included for 4 batteries. Light Green. Can convert any size AA battery to a size D battery. Option to use 1 AA, 2 AA or 3 AA for more capacity. Circuit: Parallel. 5 x Battery Adapters. Material: Durable Hard Plastic. Color: White. Are you looking for a battery conversion box switcher?. What more, this is a high power, lightweight battery conversion box switcher. Small item with great use, the battery buckle provides you an excellent performance. Converted AA size battery to C size battery. AA to C size battery adapter 4. Compatible With: all types of AA batteries. 4x Battery Converter (Batteries are not included.). With battery limit slot to fix the battery in a good place. Large strength and strong toughness. Small size, easy to carry. 5 x AAA to AA Cell Battery Converter Adaptor Case. High Quality Plastic Holder. Keep your batteries organized and protected. Small size, easy to carry. Quantity: 6pcs(Batteries not include). Can convert any size AA battery to a size C battery. Easy to use - just slide in the AA battery into the converter. Product: Battery Adapter Converter Case. 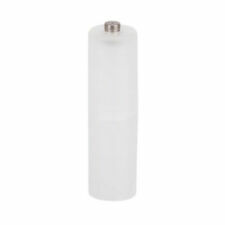 Made from high quality, durable plastic, help AA batteries provide long power life. Can convert any size AAA battery to a size C battery. Easy to use - just slide in the AAA battery into the converter. 4 pcs x AAA To C Battery Converter (other accessories demo in the picture is not included. ).